Salvia (Salvia divinorum or Salvinorin A) is an herb that is native to Mexico. The plant is a member of the sage family and has naturally occurring hallucinogenic properties. Salvia been used by the Mazatec Indians for medical practices and religious practices for centuries. The drug has effects that are similar to LSD, as it produces visual hallucinations, heightened levels of perception, and a feeling of expanded consciousness. It can induce a short but very intense psychedelic experience and may be the most potent, naturally occurring hallucinogenic substance. It is believed to carry a low risk for abuse, low risk for potential toxic effects, and few side effects. Nonetheless, the drug has no defined medicinal properties, although there is some research to suggest that it may be useful in the treatment of depression, chronic pain, and for some individuals with cognitive disorders such as dementia. The psychoactive ingredient in Salvia, Salvinorin A, must be absorbed and enter the bloodstream in order for the psychoactive effects of the drug to be experienced. Dried leaves of the plant can be smoked as a cigarette or even in a bong. Effects last up to 15 minutes. Leaves can be chewed. The longer the juice remains in the mouth, the longer the psychedelic effects last and the stronger the effects may be. The effects may last from one to two hours. Extracts of the drug can be mixed with liquid and inhaled or vaped, resulting in intense and short effects. The leaves can also be crushed and mixed with a liquid like water, and the solution can be consumed orally. However, this may only produce moderate to mild effects. The drug can also be smoked. It is heated on a piece of foil, and the vapors are inhaled via a glass pipe. This typically results in intense but short-lived effects. Salvia can produce very powerful hallucinations that can render individuals vulnerable to self-harm as a result of accidents or poor judgment. In addition, people who are emotionally unstable may find the effects of the drug frightening, and this can lead to issues with suicidality and extreme anxiety. Users may become involved in accidents or make impulsive decisions that may result in harm. Of course, it is not suggested that anyone who is under the influence of hallucinogenic substances operate automobiles or any other machinery. Despite its powerful hallucinogenic effects, the drug is legal in California for adults. It may not be sold or dispensed to minors. 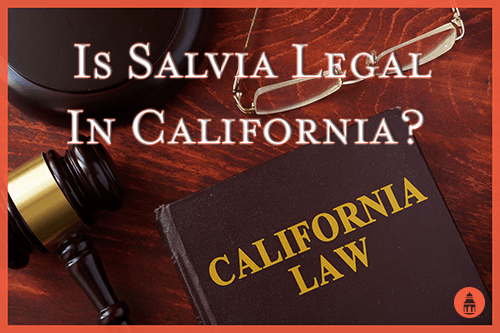 According to the California State Penal Code Section 397, any person who distributes, sells, furnishes, or administers Salvia to a person under the age of 18 is guilty of a misdemeanor. Violations are punishable by a fine of $1,000, imprisonment in the county jail for up to six months, or both. The statute was enacted in 2009 by then California Governor Arnold Schwarzenegger.